Majestic Meadows mobile home park residents struggle with unexpected rent increases. Chris Stafford, Majestic Meadows resident, says he’s “one step away” from becoming homeless. The walls in Chris Stafford's home are covered with picture frames, displaying what he calls "wood collages." He made the three-dimensional images out of wood scraps and carefully matched the grains of each piece of wood to those surrounding it—mirroring, he says, the flow of life. Each is elaborate and abstract. Their significance for Stafford, though, is poignant. After 15 years in the Taylorsville Majestic Meadows mobile home park, Stafford says he is leaving. And with him he is taking all that he has: the tangled wooden masses hung on his wall and stowed in piles around his home. "I carry it with me," he says. "It's the only thing I have with me that's me—my art forms." His exodus alongside many other Majestic Meadows residents was spurred by recent conflicts between residents and the park's corporate owners, Kingsley Management Corp. (KMC). "A rent increase of $35 per lot was applied, as well as a huge raise in gas rates. There was also an unexplained previous balance listed, even though April statements had been paid in full," a Majestic Meadows HOA rent-increase notice that was given to residents, says. "[Residents] were informed by the manager that the previous balance was for an undercharge gas error in March. Another error was made by KMC's utility department in January so residents were now being charged a higher gas rate to make up for their mistake." 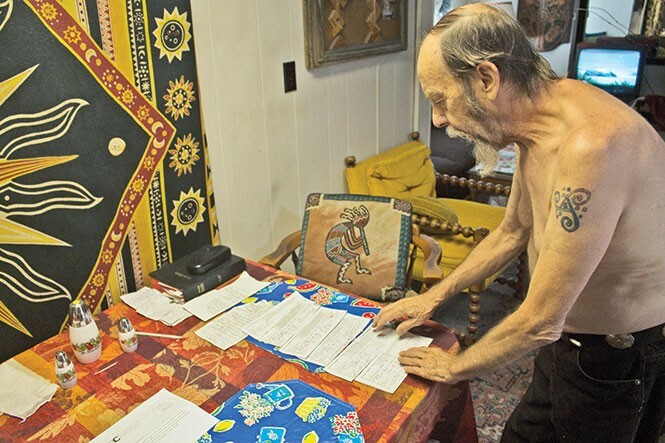 To many, the amount might seem like a nuisance, even negligible, but for Majestic Meadows residents—many of whom are living on low or fixed incomes—the miss-billing was crippling. "I'm a Vietnam vet one step away from being homeless," resident Chris Stafford says. Every year, the rents are raised, he says, and it's becoming too much. On a fixed Social Security income, he "just can't afford it." KMC's Doug Black did not respond to City Weekly's requests for comment. He did, however, respond to the Majestic Meadows HOA release in an email sent to residents, stating, "As you know, we undercharged for gas in January. We apologize for making this mistake. The June bills will reflect the total back owing. If anyone needs payments plans set up, please work with the community manager. Management will make every effort to send future bills earlier in the month." 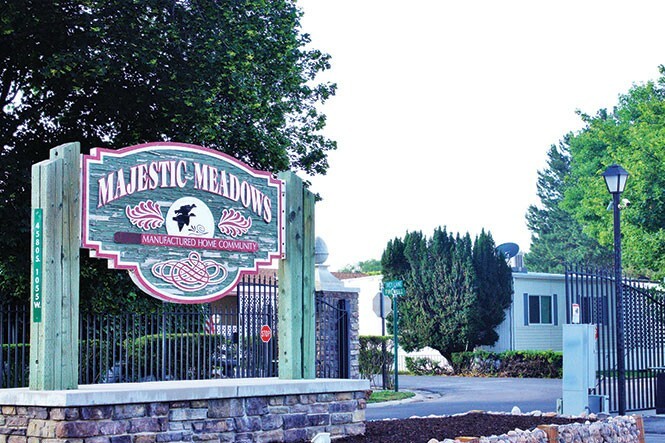 The turmoil at Majestic Meadows is not something Connie Hill, the president of the Utah Coalition of Manufactured Homeowners, sees as out of the ordinary. In fact, it happens all throughout the state. "Mobile home owners don't have the same rights a renter does," she says. "What you've got is a homeowner who should have all the rights of a homeowner, and then you have a landowner who should have all landowner rights. It raises all different kind of issues that come up and pit two owners against each other. And sometimes there is no meeting in the middle." In 2007, City Weekly published a story about the Park Hill mobile park and its residents' struggles with the park's owners attempting to sell and develop the land on which the residents' homes sat. Then, the concerns were over the threat of eviction. Now roughly two months after the missbilling issue at Majestic Meadows, residents in Murray's Winchester Estates are frantic after learning their park's owner put the property up for sale. Land ownership, for Park Hill nine years ago and more recently with Majestic Meadows and Winchester Estates, is at the forefront of the problems for mobile-home park residents. As part of her job, Hill interacts frequently with mobile-home residents and park owners. Because mobile-home residents don't own the land their home sits on, park residents like those at Majestic Meadows are especially subject to ever-increasing rents. "We went back and did a full-scope look at rent increases," she says. "When I moved here into my community 15 years ago, my rent was $330 a month—my rent is now $574. Compared to apartment rents, it is hugely unfair. Apartment rents will go up and then they will come back down as the economy adjusts." Mobile home rents, she says, "constantly go up" at about 5-6 percent each year, which is well above the 4.6 percent average increase for apartment rents, The Wall Street Journal reported in January. Why don't tenants up and move to apartments, then? Mobile homes are more convenient for elderly residents. "Because we are a part of the senior group, doing stairs is just not an option. It's tough to do stairs, which makes mobile homes—being all on one level—a good option," Hill says. "Some of the issues lead people to believe it's not an ideal situation, but it's a lifestyle choice for a lot of people." As with any housing option, prices are driven by the housing market. Many residents, Hill says, still feel the way park owners like KMC determine prices are unfair and exploitative of mobile-home residents. "We see corporations like Kingsley raising their rents because they can say it's market-driven" Hill says. "There's not a way, in my opinion, to be able to check the [rent] figures. We don't know what they are really using." "They are not driven by the market; they are driven by the bottom line," she continues. "When they say market-driven, what they are comparing it to is other mobile home communities and not the housing economy as a whole." Hill says there have been some states that "passed laws where if a senior has been in their home in the park for 10 years, at the 10-year mark, their rent caps." "That would be something to look at in the future," she says. "Any kind of rent stabilization in our legislation has not gained any kind of traction." Northern California's Sonoma County, for instance, has a mobile-home rent-stabilization program in place that only allows park owners to increase rent by a maximum of 100 percent of the Consumer Price Index (CPI). The CPI is set by the U.S. Department of Labor by completing a "complex review of the changes in the cost of goods and services," protecting renters from unlivable rent increases. Currently, one of the only pieces of legislation in effect that deals with rent increase is in Section 5 of Utah's Mobile Home Park Residency Act, which requires park owners to notify residents of a rent increase 60 days in advance. "They've been incorporated in [District] 5 for a long time," Sen. Karen Mayne, D-West Valley City, says. "It has always been an issue and it is an issue because the people that own the home, they don't own the dirt." Mayne points to property rights as the biggest hurdle for any type of protective legislation. The answers for mobile home residents lay in the Legislature, but private property rights are an issue, Mayne says. No less, she notes that she and her cohorts are working "to do what we can with the tools with we have." Still, Mayne notes, using legislative advances to help residents like those in Majestic Meadows is a "Catch 22 on a good day." Despite the difficulties, each resident's mobile home is, after all, their home, which comes with the same sentiment any homeowner would feel toward their residence. Stafford made his home undoubtedly his own. He had a lot of fun there, he says, and it's evident to see by the wood and pastiche sea shell collages, furniture draped in tapestries, the spirit man sculpture on the backside of his home and the rest of the ornate items strewn throughout the trailer. But inevitably, the end has come for Stafford, and he's not alone. The Majestic Meadows HOA Vice Chair Ted Ottinger says 11 residents are attempting to sell their homes because of the miss-billings and rent increase. "Residents who rely totally on Social Security retirement or disabilities are being stretched to the limit," Ottinger says. "As rents go up, more and more homeowners will be forced out of their homes. Sadly, few of these people have any ideas as to where they can go." Stafford's destination after Majestic Meadows is uncertain. He says he has family in Idaho and Colorado that he may see, and all the while he'll be living out of his truck. "I might just go cruising around and look for another place to live," he says. "Put my stuff and furniture in storage and just kind of travel around." He jokes that he used to call Majestic Meadows "Magic Meadows" but it has slowly turned into "Miserable Meadows." It was a place of inspiration for him. Though, he'll have to find another outlet as he hits the road, falling victim to the turmoils of mobile home ownership that persist in one form or another, year after year.